Queen guitarist Brian May says he’ll investigate this week’s removal of a Freddie Mercury gorilla art statue in Norwich, UK at the request of the Mercury Phoenix Trust over copyright issues. 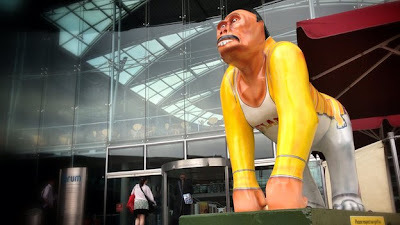 The BBC reports Wild in Art, the company that supplied the 5ft (1.5m) glass fibre gorilla canvases for a Norwich conservation art trail, was contacted by Queen's manager Jim Beach on behalf of the Freddie Mercury estate. The estate claimed the suit "worn" by the gorilla, painted by Norfolk artist Mik Richardson, breached copyright. The sculpture was removed on Monday. A spokeswoman for Brandbank, the gorilla's sponsor, told the BBC: "We, like everyone else, have been taken aback by the passionate responses to the request by the Freddie Mercury estate that Radio Go Go [the gorilla] be removed due to a suggestion of possible breach of copyright. "We have spoken to one of the executives of the estate and are endeavouring to see if we can resolve this so that there's a positive outcome for all the charities involved. Our priority is that the event is a success for the charities involved, while respecting the wishes of copyright owners and fans of Freddie Mercury."